Hillary Clinton crowned a precedent-shattering quest for the Democratic presidential nomination with a strong victory in delegate-rich California. 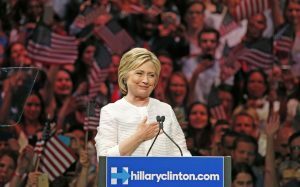 For Clinton, it was the fourth victory in half a dozen contests Tuesday. Although she had already garnered enough delegates to assume the mantle of leadership for the party at its convention in Philadelphia next month, the electoral triumphs gave her even greater momentum heading into the fall general election campaign against real estate mogul Donald Trump, who’s set to be named the Republican standardbearer at the GOP convention in Cleveland.